Intuitive Pathfinders, Astrologer Dawn and Catherine Yunt, discuss different types of card decks that will assist you on your journey. Use tarot, animal, oracle, karma and other cards to confirm you own intuition. What decks are you drawn towards? What does your intuition tell you about which cards you need? How can you use the cards for divination (what the future holds)? How can you use cards for your own growth? What can you learn about yourself? How can you use cards in conjunction with a card journal? Where can you buy decks? 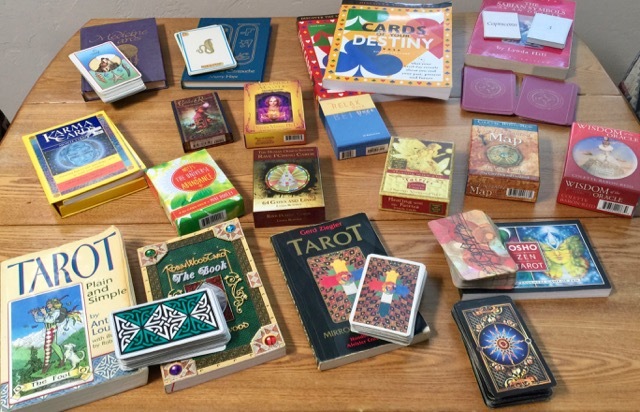 Astrologer Dawn and Catherine Yunt will also share some of their favorite decks, not only Tarot Cards, but other cards and decks as well. Remember to join Astrologer Dawn and Catherine Yunt next Wednesday for their LIVE Intuitive Pathfinders web event, Connecting with Your Heart’s Intuitive Wisdom! More information on the LIVE web event coming soon. 1:12 From last episode, Catherine drew the Six of Swords. What does that mean for you? 2:08 About Mercury and Mercury retrograde, and how its energy affects communication. Which Mercury retrograde will be toughest for you? 5:05 The High Priestess card from the Robin Wood deck and it’s meaning, again, from the last episode. 7:19 What has happened in your life since the last Intuitive Pathfinders podcast? Are you coming out of a rough time financially, emotionally, mentally, spiritually or physically? Have you been receiving intuitive awareness and messages about your current situation? Are you noticing that you are being guided by the Universe in a direction that allows you to take a step forward towards the life you really want to live? What have you become aware of since listening to the most recent Intuitive Pathfinders podcast episode? 8:20 Subjects of this episode on using cards to confirm your own intuition. 9:58 Astrologer Dawn and Catherine Yunt share some of their favorite decks with you. See the list in Resources. 11:20 Astrologer Dawn on Tarot Cards. 14:28 Regular playing cards and destiny books/cards. 16:55 Catherine Yunt on Animal Cards, divination cards. 18:45 The Sabian Symbols Cards by Lynda Hill and the Destiny Cards. 20:00 The Love Cards, a book by Robert Lee Camp. 21:15 What decks are you drawn toward? Buy the deck with which you connect most. 25:40 How do you use your cards in conjunction with a card journal. 28:58 Where can you buy cards? See the list in Resources. 29:25 Astrologer Dawn draws the Priorities card (or King Solomon Card) from The Ascended Masters Oracle Cards by Doreen Virtue Ph.D Masters. 31:37 Contact Astrologer Dawn and Catherine Yunt with your questions and comments, or if you need guidance. Find out more at IntuitivePathfinders.com. 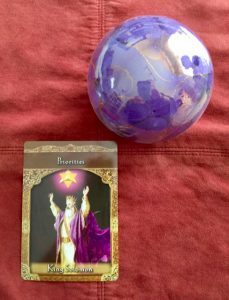 Fairies Oracle Cards – Doreen Virtue, Ph.D.